Showing 10 articles from April 21, 2014. SOUTH BEND – The South Bend City Council meeting was fairly straightforward at the April 14 meeting. 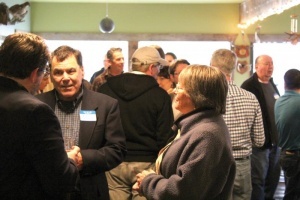 SOUTH BEND – For two hours on April 15, people gathered at the 101 Public House in South Bend as the Port of Willapa Harbor and the Dennis Company hosted a Meet and Greet for the Port’s newest residents, recreational marijuana producers and processors and medical marijuana collective gardens. Photo Courtesy of Abbi Russell..Washington State Department of Transportation workers pour concrete on the Highway 6 bridge near Menlo. The project will be finished this fall. 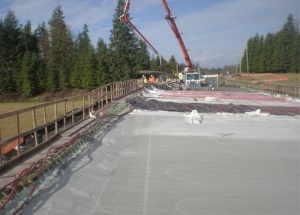 MENLO – Work on the new Route 6 bridge over the Willapa River near Menlo is on target to meet deadline with about three-quarters of the project near completion. The bridge has long been considered a critical east-west route between Interstate 5 and the Southwest Washington coast. SOUTH BEND – Kenneth Taylor, 52, Raymond, was found guilty by a jury in Pacific County Superior Court during the three-day trial that ended last Wednesday. Taylor was convicted of being over 18 and delivering methamphetamine to a person under the age of 18 and for possession of methamphetamine with the intent to deliver it. Each violation was within 1,000 feet of a school bus. 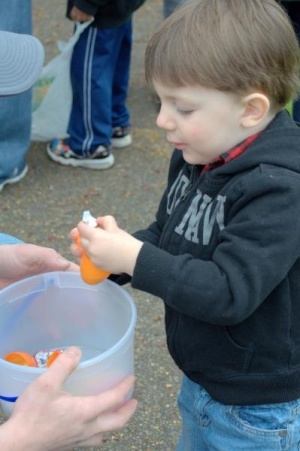 Reme Yearout was one happy 3-year-old after gathering goodies at the annual Raymond American Legion Post 150 Easter Egg Hunt Sunday afternoon. Reme was “perfectly happy” with his candy, according to his mom, Jessica. Another good crowd braved cloudy skies, but no rain, to get candy, prize baskets, and an ice cream bar. The fun took place at the L.V. & Stella Raymond Eighth Street Park. Our Lord has done amazing things this year with our team of 18, comprising 11 students and 7 staff/support. Winlock Miller Elementary School has announced open enrollment for next year’s kindergarten class and district residents are welcome to attend. Scheduled for April 29, registration will be taking place all day, as well as free aptitude screenings for children 6 years old and younger. These screenings will evaluate a child’s learning and social development to identify specific teaching needs, as well as to determine if those born after the September cut-off date will do better to enter the program early or wait one more year. Centralia High School will be hosting a public hearing April 29 to take testimony regarding a proposed oil terminal in Hoquiam, which may have an impact on local rail communities. Scheduled for 5-9 p.m. in the High School Commons (813 Eshom Rd, Centralia), the purpose of the hearing is to gather input on what should be studied in environmental impact statements being prepared for proposals submitted by Westway Terminal Company and Imperium Renewables, who are intending to expand bulk liquid storage facilities at the Port of Grays Harbor. Photo by larry bale...Raymond's Jayce Freeman did well for the Gulls in both hurdle races at Astoria. 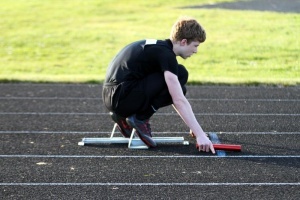 Raymond took a handful of track and field athletes down to Astoria during spring break last Saturday and came away with quite a few solid results. OLYMPIA – PUD Commissioners from four public utility districts assumed top leadership positions for 2014-2015 as the Washington Public Utility Districts Association (WPUDA) announced the election of its new officers today.